Montgomery County has an extensive program of waste management, operated by the County's Department of Environmental Protection, Division of Solid Waste Services. Their website provides a wealth of information about how to dispose of household trash, including recycling. Please visit that site for any questions you might have about trash and recycling in our neighborhood. To go to their website, CLICK HERE. In the mean time, here are some of the basics. By using the links provide in the sections below, you can visit apropriate sections in the County website to find out more detail about any issue. Household waste for single family homes in our neighborhood is normally collected every Thursday morning. This includes three kinds of household waste: trash, recycling, and yard waste. Residents are required to place household waste, in appropriate containers, at the curbside no later than 7:00 AM on collection day morning (and no earlier than the previous day). The collection day may change (usually to Friday morning) if there is a holiday earlier that week, or if the collection schedule has been disrupted for some other reason (e.g., weather). TIP: Get on the Division of Waste Services' email or text message list for delay notifications. Then you'll always know if there is a delay. You can also sign up for a weekly reminder email/text the day before each collection day. To do that, CLICK HERE. In additional to the weekly collection of household waste, residents are also entitled to up to 5 bulk trash collections (see Bulk Trash Collection, below) and an unlimited number of scrap metal collections (see Scrap Metal Collection, below) per calendar year. . Residents must provide their own trash containers, which should be rigid metal or plastic containers with tight-fitting lids and with a capacity of 15 to 45 gallons. You can use disposable plastic liners (bags), but they must be made of heavy, waterproof plastic and cannot exceed 45 gallons capacity. In addition, bags must be kept in approved containers when storing trash between collections. The County will not collect uncontained piles of trash, or overflowing containers. Almost any household paper product can be recycled by placing it the large blue Recycling Cart, which is provided by the county. To request a cart, repair a cart, or replace a cart, you must call 311. This cannot be done online, although there is additional information online about carts. CLICK HERE. Rather than listing all of the paper items that can be recycled, it's easier to list the exceptions and caveats. paper or cardboard contaminated with paint, chemicals, food, or used kitty litter. photographs/photographic paper, because of the coatings used on this type of paper. 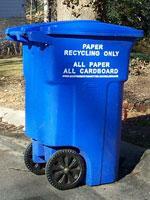 For more complete information about paper recycling, CLICK HERE. Montgomery County recycles almost any plastic, glass or metal trash. Except for large items (see Bulk Trash, below), these go in the small blue recycling bins, provided to homeowners by the County. 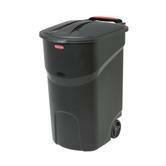 To request a new or additional bin, CLICK HERE. Just about any stiff plastic can be recycled except No. 6 plastics (polystyrene/Styrofoam). That goes in regular trash. Note that you can also dispose of aerosol spray cans in these bins, provided they did not contain hazardous material. Yard trim is leaves, grass, brush or anything else that has grown naturally in your yard. You can put this material out for collection in a paper yard trim/leaf bag, in a reusable trash container with a "Yard Trim" decal on it, or bundled with twine. You cannot use plastic trash bags for yard trim. For additional information, CLICK HERE, where you cal also find information about alternatives to curbside collection of yard trim through composting or grasscycling. $10 donation per bike to defray shipping costs. You'll be able to drop the bike(s) off at 7207 Denton Rd. Cardboard Boxes. You don't have to cut, tie, or flatten them for collection, although flattened boxes make collection easier maximize space in your cart. Just set boxes out next to your blue bin for collection. Plastic Grocery Bags. Do not put them in trash or recycling. They can be recycled at the Giant or Safeway and at some other grocery stores. Mixed Paper/Plastic/Glass. Do not mix paper items with glass/plastic/metal. Someone at the recycling center will have to manually separate them. Paper Towles/Napkins/Tissues. These do not go in the paper recycling. Put them in regular trash. Polystyrene/Styrofoam. Most plastic items can go into your recycling bin—but not polystyrene/Styrofoam (No 6. Plastic). Waxed Cardboard. Items like milk or juice cartons should be placed in the Paper recycling bin. Pizza boxes. These can go into recycling—if there is very little or no pizza residue. If there is residue, the best thing to do is rip off that part & put it in the trash. Then the rest of the box can be recycled. Light Bulbs. Older style incandescent bulbs and halogen bulbs go in regular trash - not in recycling. Compact fluorescent lamp (CFL), light emitting diode (LED), and liquid crystal display (LCD) bulbs, and florescent tubes and ballasts all contain hazardous chemicals, so they cannot disposed of in regular trash or recycling. They should be treated as Household Hazardous Waste. CLICK HERE for disposal instructions. You can also drop those items off for proper disposal at Home Depot, IKEA, Zimmerman's Home Center (Burtonsville), and Amicus Green Building Center (Kensington). Batteries. You can dispose of dry cell and alkaline batteries in your normal trash. But, almost all other batteries, including rechargeable ones (lithium batteries, lithium-ion batteries, nickel-cadmium batteries, lead acid (vehicle) batteries, uninterruptable power supplies (personal & network), and tool batteries) are treated as Household Hazardous Waste. CLICK HERE for disposal instructions.